In the beginning, when everyone had a Dreamtime, man was given the power of choice. How wonderful this magic was! A man could choose to hunt or not to hunt; a woman could choose to cook or not to cook. Children could choose whether or not to obey their parents’ words. Soon, everything was in chaos, for no one chose to hunt, cook or obey. The People everywhere were starving, naked, and wandering around lost to the power of choosing. The Great Spirit looked down, and was sad. This was not what He had imagined for his people. He chose ones who had continued to choose to do what must be done, and He gifted them with understanding of the true power of choice. They were given pictures to help tell the tales, beginning with the fan. Such a simple picture, to tell so much! 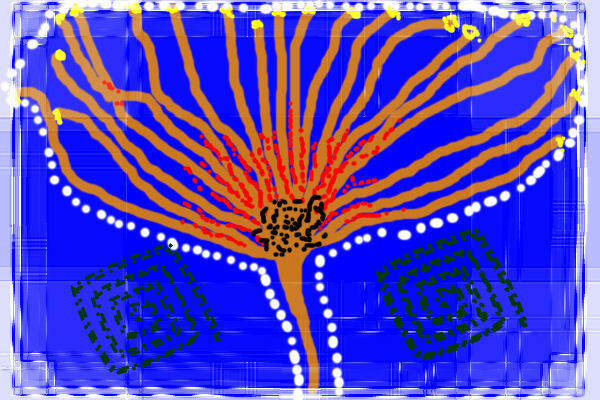 Yes, this was influenced by Aboriginal Dreamtime images. The fan is the beginning, when we are first gifted with the power of choice, but have not gained the wisdom of our choices yet. The Africans gifted us with this fan shaped destiny, at the end of every choice is a destiny, borne out by the choices that came before, and the lessons we have learned. 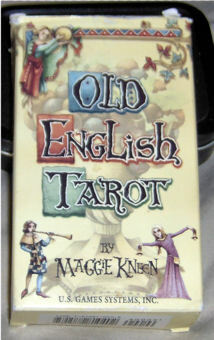 And so it is that all Tarot decks are about our choices; good, bad, or indifferent. The choices we make, and the choices we do not make will all have an impact on our destiny. The Major Arcana are the ‘big’ choices we make, and the Minor Arcana is the small everyday choices. In the Major Arcana we have the choice between love and lust (The Lovers and The Devil), self-destruction or self-loving care (Death), to follow ‘the way it has always been done’, or strike out on our own (The Hierophant), and to learn from our mistakes or not (The World and The Fool). My Sister-Witch Melanie once said that everyone has 44 lives they live. I commented that that is exactly the number of meanings to the Major Arcana; 22 cards X2 meanings (upright and reversed). I feel as though I ought to hear "Greensleeves" being srummed on a lute! With a gasp and a “I must have them!! 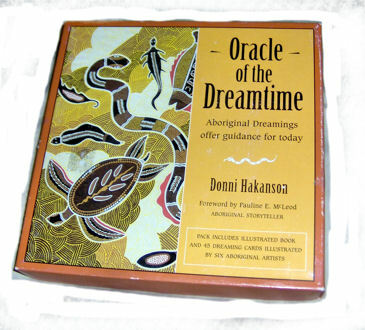 I’ll worry about the bills later…” I held this new deck in my hands, and feasted my eyes on the cover of “Oracle of the Dreamtime”! Designed, illustrated by, and based on Oz’s Aboriginal Peoples’ Dreamtime the deck is a feast for any artist’s eyes, and the accompanying book is full of tales from the Dreamtime. Mum and I spent over an hour just filling ourselves with Dreamtime tales in the book; soon I’ll sit down and really explore this delightful addition. And for anyone who is interested… this is deck number 55! This entry was posted on 08/08/2010 at 8:20 PM and is filed under Bookworm Tales, Call Me The Seeker, Doodle-a-day-oh!, It's In The Cards, My Inspirations, Reviews and Previews, Tarot Journey with tags Artists- Aboriginal, Australian Aboroginal Peoples, Dreamtime, Dreamtime Stories, Tarot, Tarot Decks. You can follow any responses to this entry through the RSS 2.0 feed. You can leave a response, or trackback from your own site.